Follicular regulatory T (TFR) cells are a newly defined regulatory T cell (Treg) subset that suppresses follicular helper T cell–mediated B cell responses in the germinal center reaction. The precise costimulatory signal requirements for proper TFR cell differentiation and function are still not known. Using conditional knockout strategies of CD28, we previously demonstrated that loss of CD28 signaling in Tregs caused autoimmunity in mice (termed CD28-ΔTreg mice), characterized by lymphadenopathy, accumulation of activated T cells, and cell-mediated inflammation of the skin and lung. In this study, we show that CD28 signaling is required for TFR cell differentiation. Treg-specific deletion of CD28 caused a reduction in TFR cell numbers and function, which resulted in increased germinal center B cells and Ab production. Moreover, residual CD28-deficient TFR cells showed a diminished suppressive capacity as assessed by their ability to inhibit Ab responses in vitro. Surprisingly, genetic deletion of B cells in CD28-ΔTreg mice prevented the development of lymphadenopathy and CD4+ T cell activation, and autoimmunity that mainly targeted skin and lung tissues. Thus, autoimmunity occurring in mice with CD28-deficient Tregs appears to be driven primarily by loss of TFR cell differentiation and function with resulting B cell–driven inflammation. Forkhead box protein 3+ regulatory T cells (Tregs) are essential for immune homeostasis and prevention of autoimmunity (1). Constitutive loss of functional Tregs in humans or mice leads to severe autoimmunity shortly after birth (2–4). Moreover, induced loss of Foxp3+ Tregs in adult animals leads to rapid autoimmune inflammation in adult animals (5), demonstrating the importance of these cells for both developing and maintaining immune self-tolerance. Thymic Treg development requires the integration of many signals from cell surface receptors, including the IL-2R and CD28 (6), which are important for effector T cell maturation. Loss of IL-2 or key component(s) of the IL-2R impairs Treg formation and leads to subsequent autoimmunity. Similarly, CD28−/− mice exhibit a loss of Tregs (7), although the impairment of effector T cells occurring as a result of loss of the CD28 costimulatory pathway prevents the emergence of rampant autoimmunity (8). As CD28 is required for normal Treg development, it was difficult if not impossible to examine its role in Treg maintenance and function using mice with constitutive deletion of CD28. Thus, we created animals with targeted loss of CD28 in Tregs [termed CD28-ΔTreg mice (9)]. Using these animals, we showed a T cell–intrinsic role for CD28 in mature Tregs, as CD28-ΔTreg mice exhibited a number of autoimmune features, including skin and lung inflammation. Tregs have important roles in suppressing both cellular and humoral responses (10), and in particular, Tregs may directly suppress B cells and autoantibody generation to prevent autoimmune diseases (11, 12). Tregs are able to kill B cells or migrate to germinal centers (GCs) where they suppress Th cell–dependent B cell responses (13, 14). The likely mechanism for this mode of action is via a newly recognized Treg subset, named follicular Treg (TFR) cells, which express CXCR5, Bcl-6, ICOS, and PD-1, share developmental cues with T follicular helper (TFH) cells, and restrain GC reactions (10, 15–17). The role of CD28 in Treg maintenance and function, together with the importance of TFR cells in controlling GC reactions and Ab production, led us to determine how the loss of CD28 in Foxp3+ cells altered TFR cell differentiation and function. In this study we show that CD28 is required for full TFR cell differentiation as well as their optimal suppressive capacity. CD28-ΔTreg mice display elevated numbers of TFH cells, reduced numbers of TFR cells, and enhanced responses to Ag immunization. Moreover, in vitro assays that control for TFR cell numbers demonstrated reduced TFR function on a per-cell basis. Surprisingly, we found that although genetic ablation of B cells only had a minimal effect on the appearance of activated CD8+ T cells in CD28-ΔTreg mice, it prevented both the accumulation of activated CD4+ T cells and the occurrence of autoimmunity. These data reveal an unexpected contribution of B cells toward autoimmunity seen when CD28 is targeted on Tregs, and suggest a critical role of the TFR–TFH–B cell axis in this process. Mice with conditional targeting of CD28 in Foxp3+ cells (CD28fl/fl Foxp3YFP-Cre, termed CD28-ΔTreg mice, and female CD28fl/fl Foxp3YFP-Cre/+) were generated and bred in our facility (9). B cell–deficient μMT B6 mice (18) were purchased from The Jackson Laboratory and bred to CD28-ΔTreg mice. All colonies were maintained under specific pathogen-free conditions. All experiments described in this manuscript were approved by the Institutional Animal Care and Use Committee at the Massachusetts General Hospital. Cell cultures were performed using RPMI 1640 (Mediatech) supplemented with 10% heat-inactivated FBS, 100 U/ml penicillin, 100 μg/ml streptomycin, 2 mM l-glutamine, and 50 mM 2-ME (Sigma-Aldrich). Fluorescent anti-CD3, anti-CD4, anti-CD8α, anti-CD19, anti-CD25, anti-CD38, anti-CD44, anti-CD62L, anti-CD69, anti-CD80, anti-IgM, anti-IgG, anti–IL-4, and anti–IL-17 Abs were purchased from BioLegend. Anti–CTLA-4, anti–PD-1, anti-Fas, anti-ICOS, and anti-CXCR5 were purchased from BD Biosciences-Pharmingen. Anti-MHC class II (MHCII), anti-GL7, anti-IFN-γ, anti-IL21, and an anti-Foxp3 staining kit were purchased from eBioscience. BD Cytofix/Perm buffer was used for intracellular staining. For cytokine detection, cells were stimulated by Leukocyte Activation Cocktail (BD Biosciences) for 4–6 h and then fixed in eBioscience Fix/Perm buffer for intracellular cytokine staining. Cells were run on a BD LSR II flow cytometer or a Beckman Coulter Navios flow cytometer and analyzed by FlowJo software (FlowJo). Freshly isolated tissues were fixed overnight at 4°C in 10% neutral buffered formalin. Tissues were then rinsed in 70% ethanol and sectioned by the Dana-Farber Harvard Cancer Center Pathology Core for H&E staining. Immunohistochemical analysis was performed at the Dana-Farber Harvard Cancer Center Rodent Histopathology Core described as previously (9). Tissue sections were incubated with Abs against mouse B220 and IgM (BD Biosciences), followed by biotinylated secondary Abs (Vector). Briefly, 100 μg of nitrophenyl (NP)18-OVA (Bioresearch Technologies) was suspended in a 1:1 H37RA CFA emulsion (Sigma) and injected s.c. into the left and right flanks. After 7 d mice were euthanized and inguinal draining lymph nodes (dLNs) and/or spleen were harvested for flow cytometric analysis or suppression assays (see below). The in vitro suppression assay was performed as previously reported (19, 20). Briefly, cell populations were sorted to 99% purity on an Aria II flow cytometer. Sorted cells were counted on an Accuri cytometer (BD Biosciences) by gating live cells only. Then 5 × 104 B cells and 3 × 104 TFH cells [stained by Cell Trace Violet (Invitrogen) in indicated experiments according to the manufacturer’s instructions] with or without 1.5 × 104 TFR from dLNs were cultured with 2 μg/ml soluble anti-CD3 (2C11; BioXcell) and 5 μg/ml anti-IgM (Jackson ImmunoResearch). After 6 d, cells were harvested and analyzed by flow cytometry. The proliferation of TFH cells was detected by Ki67 staining or the dilution of Cell Trace Violet. Comparison of means between groups used the two-tailed Student t test. Differences were considered statistically significant at p < 0.05. CD28fl/fl mice were bred with Foxp3YFP-Cre mice to generate mice with a specific deletion of CD28 in Foxp3+ Tregs (CD28-ΔTreg mice) (9). As previously reported, from birth to ∼1 mo of age, CD28-ΔTreg mice had a relatively normal appearance. However, by 8–12 wk of age, CD28-ΔTreg mice developed signs of autoimmunity. This manifested as crusting eyelids, hair loss from the face and trunk, inflammatory infiltrates of the skin and lungs, and generalized lymphadenopathy and splenomegaly characterized by accumulation of activated (CD44hiCD62Llo) CD4+ and CD8+ T cells. These findings clearly implicated a Treg-intrinsic function for CD28 in normal immune homeostasis, but did not define the role of individual immune effector components, i.e., T and/or B cells. The role of the latter was of particular interest, given the recent discovery of TFR cells and their crucial role in controlling humoral immune responses. Thus we examined the role of B cells in the autoimmune phenotype of CD28-ΔTreg mice. 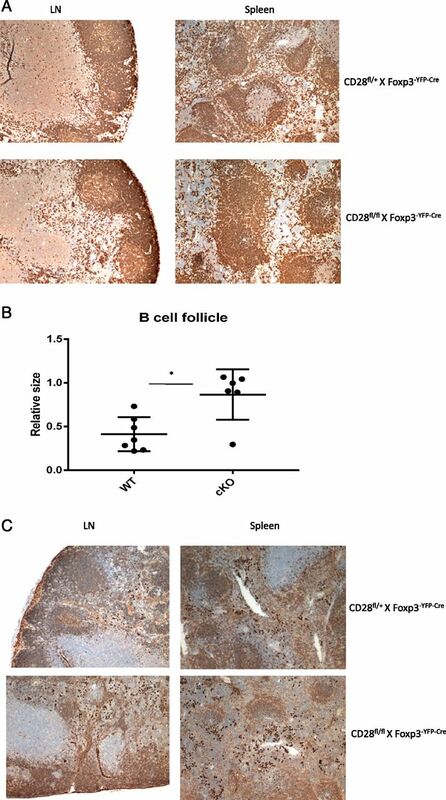 Immunohistochemical staining revealed elevated numbers of B220+ B cells with larger follicle sizes, and enhanced IgG production in the follicles of enlarged LNs of 4 mo old CD28-ΔTreg mice (Fig. 1A–C). As CD28 is only deleted in mature Foxp3+ Tregs, we speculated that the abnormal B cell activation in CD28-ΔTreg mice might be attributed to a defect of TFR cells in the absence of CD28 signaling. The percentage of B cells in LNs, but not spleen, was increased in inflamed 2 mo old CD28-ΔTreg mice (Fig. 2A, 2B). Because of the increased total cellularity in the dLNs of CD28-ΔTreg mice, as well as the relatively normal percentages of most other immune cells such as NK cells, myeloid cells, and dendritic cells (9), the enhanced B cell percentages and numbers indicate an actual and specific expansion of B cells (Fig. 2B). Concurrent with this, the serum IgG1 and IgG2a levels were increased in autoimmune CD28-ΔTreg mice (Fig. 2C), although we did not observe any alterations in anti-dsDNA Abs (Fig. 2D). Nevertheless, GC B cells (GL-7+ Fas+) were increased in CD28-ΔTreg mice, along with increases in class-switched IgG+IgM−, IgG+CD38+ effector/memory B cells, and plasma cells (Fig. 2E–I). Finally, we noted evidence of general B cell activation, as B cells in CD28-ΔTreg mice upregulated their surface expression of CD69, CD80, and MHCII (Fig. 2J). Collectively, the analysis of B cell phenotype indicates that CD28-deficient mice have increased B cell responses. B cell and IgG production in LN and spleen of CD28-ΔTreg mice. Autoimmune CD28-ΔTreg 4 mo old mice were sacrificed and LNs and spleens were fixed in 10% formalin overnight. Immunohistochemistry was performed to detect B cells (B220 staining) in (A) and follicle sizes were measured by Image J in (B). IgG production is shown in (C). Original magnification ×100. Minimum of two animals in each phenotype were analyzed. *p < 0.05. cKO, CD28-ΔTreg mice. B cell expansion and activation in CD28-ΔTreg mice. (A) Representative plot of B cells in LNs of 2–3 mo old WT and CD28-ΔTreg mice. (B) Summary of (A). Each dot represents one mouse. (C and D) Serum IgG1 and IgG2a (C) and anti-dsDNA Abs (D) in 2 ∼ 3 mo old mice. (E–H) Characterization of B cells in LNs. Gated B220+ or CD19+ B cells were stained for Fas+GL7+ GC cells (E), IgG+CD38+ cells (F), IgG+IgM− (G), and CD19+CD138+ plasma cells (H). (I) Statistical analysis. (J) Representative surface expression of CD25, CD80, CD69, and MHCII in B cells (B220+) of 2 mo old WT of CD28-ΔTreg mice. Over five WT and five CD28-ΔTreg mice were analyzed. *p < 0.05, **p < 0.01, ***p < 0.001. N.S., not significant. CD4+ TFH cells migrate to B cell follicles to provide signals for B cell activation and Ab production (21, 22), whereas TFR cells are the major regulatory population that control TFH and B cell activation. Compared to control unimmunized wild type (WT) mice (CD28+/+Foxp3YFP-Cre mice), the LNs of 2 mo old CD28-ΔTreg mice showed significantly enhanced TFH cell (CD4+Foxp3−CXCR5+ICOS+) percentages and numbers, with a reciprocal but nonsignificant reduction of TFR percentages (Fig. 3A), suggesting that the reduced TFR cell percentage and/or TFR cell function in CD28-ΔTreg mice results in a failure to regulate TFH cell homeostasis. The low percentage of TFR cells in the control conditions without immunization prevented a robust comparison of TFR cell differentiation. However, the ratio of TFR to TFH cells is known to be a decisive factor in the magnitude of humoral immune response (10, 19), and the reduced TFR to TFH cell ratio in the CD28-ΔTreg points to dysregulation of humoral immune responses. Thus, to further test the role of CD28 in TFR cell differentiation, WT or CD28-ΔTreg mice were immunized by NP-OVA/CFA s.c. As shown in Fig. 3B, NP-OVA immunization induced expansion of both TFH and TFR cells in WT mice, but CD28-ΔTreg mice showed defective induction of TFR cells in the dLNs. CD28 is required for TFR cell differentiation in LNs. (A) Percentage and number of TFH in total CD4+YFP− cells and percentage and number of TFR in CD4+YFP+ Tregs in LNs of WT and CD28-ΔTreg mice (YFP is a Foxp3 reporter). (B) WT and CD28-ΔTreg mice were s.c. immunized with NP-OVA/CFA. After 7 d, TFH and TFR percentage were analyzed as in (A). Representative flow cytometry plots (left) and quantification (right). (C and D) In healthy CD28fl/fl × Foxp3YFP-CRE/+ female mice (unimmunized or NP-OVA immunized), CD28-deficient TFR (CD4+Foxp3+YFP+CXCR5+ICOS+), and CD28-sufficient TFR (CD4+Foxp3+YFP−CXCR5+ICOS+) were gated as (C) (representative of immunized dLN), and the percentage of TFR were shown in (D). Two to three animals were analyzed. (E–H) Splenocytes of WT and CD28-ΔTreg mice were stimulated in vitro with PMA and ionomycin for 5 h in the presence of Golgi block. Representative flow cytometry of analyses of IL-4, IL-17, IL-21, and IFN-γ in CD4+ cells (E) and IFN-γ in CD8+ cells (G) and their quantification (F and H) are shown. Data are representative of over four WT and four CD28-ΔTreg mice analyzed. *p < 0.05, **p < 0.01, ***p < 0.001. As CD28-ΔTreg have an autoimmune phenotype, it remained possible that the resultant inflammation was the cause of defective TFR cell development, rather than a cell-intrinsic role for CD28 in TFR cells. To address this, we used female mice that were heterozygous for Foxp3-Cre (Foxp3+/Cre). We have shown previously (Ref. 9 and data not shown), due to random X-chromosome inactivation roughly 50% of Tregs in CD28fl/fl × Foxp3+/Cre mice have deleted CD28 (and can be identified by YFP expression), whereas half retain CD28 and are YFP−. As shown in Fig. 3C and 3D, we observed significantly higher percentages of CD28+ TFR cells compared with CD28− TFR cells in both naive and immunized mice. This is consistent with the data in Fig. 3B showing lower numbers of TFR cells in CD28-ΔTreg mice and confirms a cell-intrinsic role for CD28 in TFR cell development. Specific cytokines, such as IL-4 and IL-21, are important in supporting humoral responses. Thus we next examined selected cytokine production in CD28-ΔTreg mice. Compared to WT control mice, we observed significantly elevated percentages of CD4+ cells from 3 mo old CD28-ΔTreg mice secreting IL-4 and IL-21, and to a lesser extent IL-17 and IFN-γ (Fig. 3E, 3F). As IL-21 is the major cytokine to direct the generation of TFH cells, its enhanced expression in CD28-ΔTreg mice matched the increased humoral immune response (23, 24). In addition, B cells and IL-21 can activate and enhance the cytotoxicity of CD8+ cells (25, 26). Likewise, CD8+ cells in CD28-ΔTreg mice demonstrated enhanced IFN-γ production (Fig. 3G, 3H). Previously, we demonstrated that global CD28−/− mice had severely reduced percentages of TFR cells (19). However, in this study we found that the reduction in TFR cells with conditional deletion of CD28 on Tregs was less profound, despite the marked failure to regulate Ab production. Therefore, we next determined whether loss of CD28 alters TFR suppressive capacity. To do this, we performed an in vitro TFR suppression assay in which WT (CD28fl/+ × Foxp3YFP-Cre) and CD28-ΔTreg mice were immunized with NP-OVA. After 7 d, TFH cells and B cells were sorted from control mice and cocultured in the presence or absence of TFR cells from WT or CD28-ΔTreg mice along with anti-IgM and anti-CD3 for 6 d. We found that CD28-ΔTFR cells suppressed the expression of Ki67, a cell cycle protein, and proliferation in TFH cells to a much lesser degree compared with control TFR cells (Fig. 4A, 4B). Moreover, TFR cells from CD28-ΔTreg mice were less effective at suppressing class-switch recombination and proliferation in B cells compared with control TFR cells, suggesting that CD28 costimulation is essential for the full suppressive capacity of TFR cells (Fig. 4C). Consistent with previous studies (27, 28). CXCR5−ICOS− Tregs from immunized WT (CD28fl/+ × Foxp3YFP-Cre) mice were far less efficient at suppressing class-switch recombination than were WT TFR cells, showing the same modest level of suppression as was observed for CD28-deleted TFR cells (Fig. 4D). CD28 is required for the suppressive function of TFR cells. (A–E) Sorted GL7− B cells and CD4+Foxp3− TFH cells were cocultured with CD28-sufficient TFR (CD28fl/+TFR from CD28fl/+ × Foxp3YFP-Cre mice) or CD28-deficient TFR (CD28fl/flTFR from CD28fl/fl × Foxp3YFP-Cre mice) for 6 d in vitro. The proliferation of TFH cells were detected by Ki67 staining and Cell Trace violet dilution (A and B). In (C), B cells were stained for GL7+IgG1+. (D). Similar to (C), CD28-sufficient Tregs (CD28fl/+ × Foxp3YFP-Cre) and CD28-deficient Tregs (CD28fl/fl × Foxp3YFP-Cre) were also sorted and cocultured with TFH and B cells in the suppression assay. (E) CD28-sufficient (CD4+Foxp3+YFP−) and CD28-deficient Tregs (CD4+Foxp3+YFP+) from LN or spleen of healthy CD28fl/fl × Foxp3YFP-Cre/+ female mice were compared for CXCR5 and Bcl6 expression. Filled line is isotype staining. (F) Treg markers in WT and CD28-deficient TFR from 3 mo old WT and autoimmune CD28-ΔTreg mice. Experiments were repeated at least four times. ***p < 0.001. Previously, we have shown that CD28-deficient Tregs had reduced expression of CTLA-4 (9), a molecule known to regulate the proliferation and function of TFR cells (29, 30). However, as shown in Fig. 4F, CD28-ΔTFR cells express comparable levels of CTLA-4, CD44, CD25, and ICOS as WT TFR cells. Therefore, alterations in CTLA-4 did not appear to be responsible for the reduced suppressive capacity of CD28-deficient TFR. We have also shown that ICOS expression on TFR cells can be used to identify TFR cells that gain access to the B cell follicle (28). We did not observe a difference in ICOS expression in CD28-deficient TFR cells (Fig. 4F). Using female mice that were heterozygous for Foxp3-Cre (Fig. 4E, see details of experimental system in Fig. 3), we observed diminished CXCR5 staining in CD28-deficient Tregs, with little or no difference in bcl-6 expression. These data show a cell-intrinsic role for CD28 in CXCR5 expression but suggest there is little role for CD28 signals in initiation of lineage-specific transcription factor expression. To assess whether the skin autoimmunity in CD28-ΔTreg mice was due to enhanced B cell responses allowed by defective TFR cell differentiation and function, we bred CD28-ΔTreg mice to μMT mice, which lack B cells (18). As shown in Supplemental Fig. 1, and consistent with previous studies (31, 32), loss of B cells led to a block of TFH cell differentiation in CD28-ΔTreg × μMT mice. Strikingly, the lack of B cells rescued the severe autoimmunity seen in CD28-ΔTreg mice. This included the phenotype of grossly visible skin inflammation (Fig. 5A, indicated by arrows), lymphadenopathy (Fig. 5B), and inflammatory histology in the skin and lung, the main target organs of disease we observed in CD28-ΔTreg mice (9) (Fig. 5C). B cell deficiency prevents autoimmunity in CD28-ΔTreg mice. (A). Autoimmune phenotype in 5 mo old CD28fl/fl × Foxp3YFP-Cre mice is abrogated in CD28fl/flX Foxp3YFP-CreX μ/μ. Arrows indicate inflammation. (B) Macroscopic appearance of LN, spleen, and thymus in CD28fl/+ × Foxp3YFP-Cre 1), CD28fl/fl × Foxp3YFP-Cre 2), CD28fl/fl × Foxp3YFP-Cre × μ/+ 3), and CD28fl/fl × Foxp3YFP-Cre × μ/μΤ 4). (C) H&E staining of fixed lung and ear tissues from 5 mo old CD28fl/+ × Foxp3YFP-Cre, CD28fl/fl × Foxp3YFP-Cre × μ/+, and CD28fl/fl × Foxp3YFP-Cre × μ/μ. Original magnification ×100. Data are representative of more than three animals in each phenotype analyzed. *p < 0.05. Finally, we examined T cell activation in lymphoid organs of CD28-ΔTreg × μMT mice. B cell deficiency completely prevented the activation of CD4+ T cells, but not CD8+ T cells in the LNs and spleen of CD28-ΔTreg × μMT mice (Fig. 6A, 6B, Supplemental Fig. 2). Interestingly, although CD8+ effectors were not prevented, IFN-γ production by both CD4+ and CD8+ T cells was reduced (Fig. 6C, 6D). Collectively, these results indicate a dissociation between the role of B cells in mediating CD4+ versus CD8+ T cell activation in CD28-ΔTreg mice, and demonstrate that B cells are required for activation of CD4+ T cells and/or Ab production for the autoimmunity observed in these animals. B cell deficiency prevents overactivation of CD4+ T cells in CD28-ΔTreg mice. Representative flow cytometry plots (A) and quantification (B). Percentage of CD44hiCD62Llo effector cells in CD4+ and CD8+ T cells from LNs of 5 mo old CD28fl/fl × Foxp3YFP-Cre × μ/+ and CD28fl/fl × Foxp3YFP-Cre × μ/μ mice. Representative flow cytometry plots (C) and quantification (D). IL-4 production in CD4+ splenic T cells and IFN-γ production in CD4+ and CD8+ splenic T cells of 5 mo old mice. Splenocytes were stimulated in vitro by PMA and ionomycin for 5 h in the presence of Golgi block. cKO × μ/+, CD28fl/fl × Foxp3YFP-Cre × μ/+ mice; cKO × μ/μ, CD28fl/fl × Foxp3YFP-Cre × μ/μ mice. More than three animals in each phenotype were analyzed. *p < 0.05, **p < 0.01, ***p < 0.001. 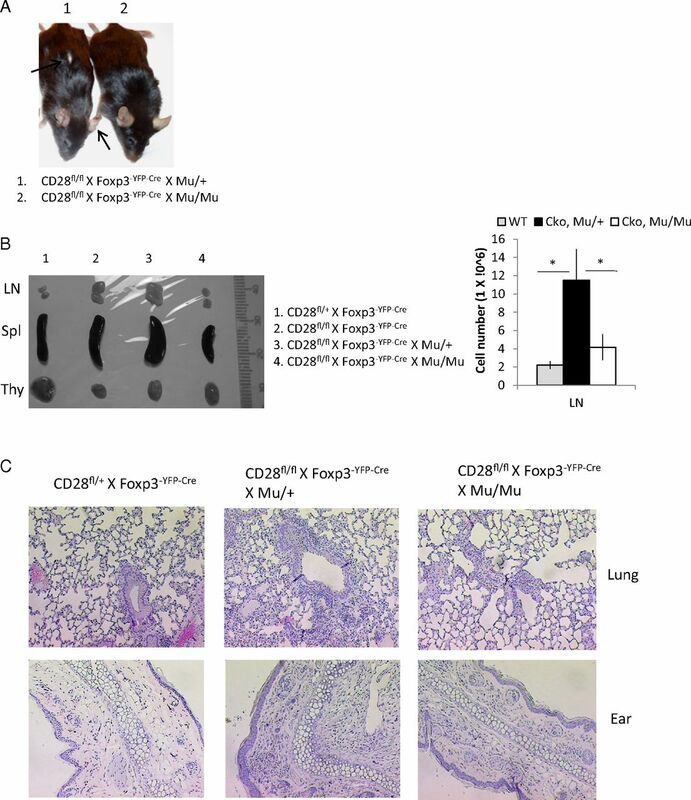 Previously we reported that cell-specific deletion of CD28 on Foxp3+ Tregs (CD28-ΔTreg mice) led to a systemic autoimmune disease characterized by activation of CD4+ and CD8+ T cells, with skin and lung inflammation (9). In this study, we further characterized these animals and found a striking elevation of serum Igs accompanied by increases in IgG class-switched and memory B cells, as well as GC B cells in the LNs of these animals. It is well established that B cell activation in GCs is regulated by TFR cells. This prompted us to examine how loss of CD28 in Tregs might specifically affect TFR cells. We found a marked reduction in TFR cells, both in unimmunized animals and following immunization. This suggested that the dysregulation of B cell responses observed in unmanipulated CD28-ΔTreg mice might be due to alterations in TFR numbers. However, another, non–mutually exclusive possibility was that optimal TFR function required CD28 and thus the ability of TFR cells to control humoral responses was intrinsically defective, independent of cell number. To test this possibility, we turned to an in vitro assay of TFR cell–suppressive capability, and showed that indeed, loss of CD28 led to an impairment in TFR cell function. The mechanism by which CD28 is required for optimal TFR cell function remains under investigation. Previously, CD28 signaling in CD4+ T cells has been shown to induce the expression of both CXCR5 and ICOS (33, 34). Compared to WT TFR, CD28-ΔTregs did not demonstrate a significant reduction in the expression of ICOS. However, it is still plausible that CD28 signaling may regulate the coexpression of CXCR5 and ICOS in Tregs that might dictate TFR cell induction upon immune stimulation. Perhaps the most striking finding in our studies was the loss of aberrant CD4+ T cell activation and the prevention of clinical autoimmunity by genetic deletion of B cells, indicating a strong and unexpected B cell contribution to autoimmunity. Interestingly, previous work has demonstrated that the absence of B cells, or therapeutic depletion of B cells, reduces autoimmune pathology and prolongs survival in scurfy mice (35). In a related vein, a number of clinical trials have shown that B cell–depletional therapies ameliorate autoimmune diseases, such as rheumatoid arthritis and multiple sclerosis, which are believed to have predominant, if not exclusive, T cell pathogenesis (36–38). Collectively, our findings demonstrate a clear role for B cells in T cell–driven autoimmune inflammation. It seems likely that this role is via Ag presentation, although this remains to be formally demonstrated and other factors such as Ab or cytokine production cannot be completely excluded. Interestingly, despite the fact that loss of B cells prevented overt autoimmunity from developing, we found a split effect on T cell activation. Specifically, whereas B cell depletion prevented the activation of CD4+ T cells, there was little to no effect on CD8+ T cell activation. This may indicate a differential or preferential reliance of CD4+ versus CD8+ T cells for types of APCs. Alternatively, the functional deficiency of CD28-ΔTregs may induce aberrant activation of CD8+ T cells. In summary, our data reveal an essential role for CD28 in directing the development and function of TFR cells to control B cell activation and humoral immune responses. In the autoimmune disease model of CD28-ΔTreg mice, reduction in TFR cell differentiation and suppressive function results in broad dysregulation of B cell homeostasis. Importantly, genetic depletion of B cells in CD28-ΔTreg mice prevented CD4+ T cell activation and rescued the autoimmune phenotype. Although other Treg subsets may contribute, our findings suggest that alterations in TFR cell differentiation and/or function result in systemic autoimmunity and skin inflammation. Future work will be needed to determine how promoting TFR cell differentiation and function can be used to help treat autoimmune diseases including psoriasis. We thank members of the Turka and Sharpe laboratories for many helpful discussions over the course of this work. This work was supported by National Institutes of Health Grants AI-037691, AI 040614, AI-056299, and HL-11879.
. 2008. Human regulatory T cells: role in autoimmune disease and therapeutic opportunities. Immunol. Rev. 223: 371–390.
. 2001. The immune dysregulation, polyendocrinopathy, enteropathy, X-linked syndrome (IPEX) is caused by mutations of FOXP3. Nat. Genet. 27: 20–21.
. 2007. Regulatory T cells prevent catastrophic autoimmunity throughout the lifespan of mice. Nat. Immunol. 8: 191–197.
. 2014. Signals and pathways controlling regulatory T cells. Immunol. Rev. 258: 117–131.
. 2005. CD28 costimulation of developing thymocytes induces Foxp3 expression and regulatory T cell differentiation independently of interleukin 2. Nat. Immunol. 6: 152–162.
. 2000. B7/CD28 costimulation is essential for the homeostasis of the CD4+CD25+ immunoregulatory T cells that control autoimmune diabetes. Immunity 12: 431–440.
. 2015. T follicular regulatory cells in the regulation of B cell responses. Trends Immunol. 36: 410–418.
. 2009. CD25+ T(reg) specifically suppress auto-Ab generation against pancreatic tissue autoantigens. Eur. J. Immunol. 39: 225–233.
. 2009. Cutting edge: regulatory T cells directly suppress B cells in systemic lupus erythematosus. J. Immunol. 183: 1518–1522.
. 2004. Regulatory T cells can migrate to follicles upon T cell activation and suppress GC-Th cells and GC-Th cell-driven B cell responses. J. Clin. Invest. 114: 1640–1649.
. 2006. Activated CD4+CD25+ T cells selectively kill B lymphocytes. Blood 107: 3925–3932.
. 2011. Follicular regulatory T cells expressing Foxp3 and Bcl-6 suppress germinal center reactions. Nat. Med. 17: 983–988.
. 2011. Regulation of the germinal center reaction by Foxp3+ follicular regulatory T cells. J. Immunol. 187: 4553–4560.
. 2011. Foxp3+ follicular regulatory T cells control the germinal center response. Nat. Med. 17: 975–982.
. 2013. The receptor PD-1 controls follicular regulatory T cells in the lymph nodes and blood. Nat. Immunol. 14: 152–161.
. 2015. In vitro assay to sensitively measure T(FR) suppressive capacity and T(FH) stimulation of B cell responses. Methods Mol. Biol. 1291: 151–160.
. 2008. A fundamental role for interleukin-21 in the generation of T follicular helper cells. Immunity 29: 127–137.
. 2016. Biological effects of IL-21 on different immune cells and its role in autoimmune diseases. Immunobiology 221: 357–367.
. 2000. Cutting edge: B cells promote CD8+ T cell activation in MRL-Fas(lpr) mice independently of MHC class I antigen presentation. J. Immunol. 164: 1658–1662.
. 2016. Suppression by TFR cells leads to durable and selective inhibition of B cell effector function. Nat. Immunol. 17: 1436–1446.
. 2014. Circulating T follicular regulatory and helper cells have memory-like properties. J. Clin. Invest. 124: 5191–5204.
. 2014. The coinhibitory receptor CTLA-4 controls B cell responses by modulating T follicular helper, T follicular regulatory, and T regulatory cells. Immunity 41: 1026–1039.
. 2014. Regulatory T cells control antigen-specific expansion of Tfh cell number and humoral immune responses via the coreceptor CTLA-4. Immunity 41: 1013–1025.
. 1999. Compromised OX40 function in CD28-deficient mice is linked with failure to develop CXC chemokine receptor 5-positive CD4 cells and germinal centers. J. Exp. Med. 190: 1115–1122.
. 2006. Regulation of mouse inducible costimulator (ICOS) expression by Fyn-NFATc2 and ERK signaling in T cells. J. Biol. Chem. 281: 28666–28678.
. 2013. B cells are critical for autoimmune pathology in Scurfy mice. Proc. Natl. Acad. Sci. USA 110: 19042–19047.
. 2012. B cell depletion therapy ameliorates autoimmune disease through ablation of IL-6-producing B cells. J. Exp. Med. 209: 1001–1010.
. 2013. B-cell targeted therapeutics in clinical development. Arthritis Res. Ther. 15(Suppl. 1): S4.
. 2008. B-cell depletion with rituximab in relapsing-remitting multiple sclerosis. N. Engl. J. Med. 358: 676–688.